We’d love your help. Let us know what’s wrong with this preview of Snowbound by Olivier Lafont. The youngest brother, Niccolo Piccolo, is rai Christmas is dying. I have always considered myself a non-fantasy book lover! That's the reason why it took me years to find Harry Potter and Twilight. Well, you cannot compare both of these, but I knew I had developed a taste for it. So when I got an opportunity to grab this book on Santa Claus and doppelgangers, I took it without second thoughts! Oliver Lafont's Snowbound is the story of Santa and his three sons. The blurb begins by saying “Christmas is dying. The last Santa Claus had triplets who each inherited I have always considered myself a non-fantasy book lover! That's the reason why it took me years to find Harry Potter and Twilight. Well, you cannot compare both of these, but I knew I had developed a taste for it. So when I got an opportunity to grab this book on Santa Claus and doppelgangers, I took it without second thoughts! Oliver Lafont's Snowbound is the story of Santa and his three sons. The blurb begins by saying “Christmas is dying. The last Santa Claus had triplets who each inherited a portion of his father’s power, and that split is now tearing apart the soul of Christmas.” So, you get the drift! Olivier's Snowbound is just like Christmas - magical and bewitching. It's also a perfect mix of suspense and mystery around Santa's three sons. The story is fast-paced and doesn't fail to keep the reader hooked at all times.What I loved the most was the vivid descriptions of various places from the North Pole to Mediterranean to Africa. A childhood fantasy, you can pick this book if you want to go on a rollercoaster ride of love and friendship, of treachery and righteousness. inbuilt, typical image of Santa in his red and white robe, reindeer and elves in their green dress. But Snowbound by Olivier Lafont is story of Santa’s three sons with a big twist. Though it is a fiction with childhood fantasy theme, it has an adult angle (with reference to age and antagonist and not otherwise). Olivier Lafont has panache for writing stories with suspense and mystery. His Sweet Revenge was first book I read and I had liked his writing style. Similarly Snowbound too has mystery around Santa’s three sons and captures reader’s attention right from start till the end. The story is just too addictive; you really can’t stop till you finish it. But there are few drawbacks which I would like to mention. The author has used foreign dialect but no translations of those are given. I would have liked it if the translation was mentioned below, as not all are well versed or have knowledge of French, Italian or Ukraine dialect. Also in couple of sentences I found some simple editing errors which could have been avoided. But other than that, I absolutely loved reading Snowbound even if it is little difficult to imagine Santa’s children in negative avtar. Snowbound is a must read if you like fantasy, fiction and Christmas with Santa. Three brothers and all of them unfit so who will be Santa Claus? #Snowbound has a thought-provoking premise and is an adventurous read. #SNOWBOUND is about Santa Claus, and Christmas and how all of it could disappear. Oliver has woven Christmas and myths and magic, merging them to bring to life a delightful story of two boys, Adam and Zach who are trying to save Christmas. The boys are magically transported to the realm of Santa and are surprised to find reindeers who talk, elves that are super n Three brothers and all of them unfit so who will be Santa Claus? #Snowbound has a thought-provoking premise and is an adventurous read. #SNOWBOUND is about Santa Claus, and Christmas and how all of it could disappear. Oliver has woven Christmas and myths and magic, merging them to bring to life a delightful story of two boys, Adam and Zach who are trying to save Christmas. The boys are magically transported to the realm of Santa and are surprised to find reindeers who talk, elves that are super ninjas and a Santa Claus who is missing. Adam and Zach are not really friends but thrown together into an unknown world and they start helping each other. Mysterious characters find them, guiding them to search for the ‘real Santa’ in #Snowbound. Niccolo, the elder brother sends them to ask the other two to relinquish their claim for being Santa as time is running out. Learning on the run, making new friends, finding unbelievable adventures and facing their fears and faults. Challenges, mysteries, a sword and a mask add to their quest, sometimes helping sometimes not so much. The boys are quick learners and make a friend of the witch, Tatyana who helps them. Values, honesty, friendship, morals and doing the right thing, listening to your heart blend with the fiction of Snowbound to make a reality that is quite possible if we forget the magic of Christmas. Not a bit preachy but still very interesting, the book kept me hooked as I was eager to learn who would the new Santa be. A translation of the other language spoken would have been better but I could guess what was being talked about. Olivier has filled this book with not just escapades and magic but valuable lessons as well. It is a good book to be read around this season when Christmas is almost here. Reiterating the values and ideals, we hold dear. 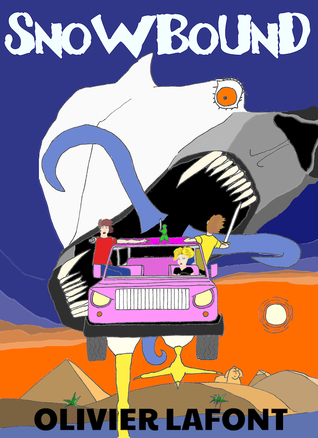 A flying jeep that turns into a chicken, magical powers that make the boys almost invincible and plain old faith make Adam’s mission a success. It is not as easy as you think but you will need to read the book to know how. You will be forgiven if like me you think that it could be Adam – I know! How silly is that! That’s how the blurb of the book starts. I was intrigued. Three possible Santa Clauses? It certainly looked interesting. And the book absolutely lives up to the promise. Olivier Lafont’s book is fast paced, yet I had to read it slowly, because I did not want to miss any of the action packed adventures of Adam and Zach as they try to “Christmas is dying. Olivier Lafont’s book is fast paced, yet I had to read it slowly, because I did not want to miss any of the action packed adventures of Adam and Zach as they try to save Christmas. Lafont has an amazing way of telling a story and instead of Snowbound the title should have been spell bound. His way of describing things and people made the writer in me bow down in awe. Can you imagine a creature like this? The book is also laced with pearls of wisdom as the boys find themselves as they figure out what needs to be done. The timing of the book couldn’t be better. With Christmas a few months away, it will make a great gift for pre and young teenagers. Do pick up a copy and become part of the quest to find the true Santa. Plot/ Story-line: Ah! Refreshing. Never thought that a story involving Santa Claus and Christmas could be so thrilling that it would make me glued late into the night just to know the end. Slow at first, the story did pickup after the initial few chapters and then it was akin to riding a sledge pulled by Santa’s reindeer fast and thrilling. The story has all the elements of a thriller combined with fantasy. There is magic, greed, treachery and in the midst of all these a subtle hint of love WOWs!! The story has all the elements of a thriller combined with fantasy. There is magic, greed, treachery and in the midst of all these a subtle hint of love or should I say a liking, blooming. Fear gives way to friendship and might falls prey to solidarity. The twists and turns are well- timed. However the only thing that left me dissatisfied is the lack of a glossary/ footnotes at the end of each page where some French/ Italian/ Ukrainian words/ phrases were used. An insight into these would have made the reading more enjoyable. Characterization: The characters are well- developed and one can actually visualize them while reading about them. The only character that left me a bit confused was that of La Signora. I would have loved to know more about her. Language: Crisp and lucid. The only stumbling blocks were those snatches of conversation in French/ Italian/ Ukrainian dialect that appeared Greek on account of lack of footnotes explaining what they meant. Editing: Needs to be tightened at places. I have always thought myself as a completely nonfantasy book lover. And I must confess, I have been surprised a couple of times by some books with their fantastical elements. I went into this book keeping in mind that this book is about Santa and elves and kids. Not very enthused. But I have wanted to try one book of author Lafont. And oh my, oh my, did this book take me completely by surprise. I was completely hooked the moment Adam and Zach tumbled through the out of order photometronic booth. The journey was at times nail-biting, at times wonderous, at times so picturesque, but at all the time it was a great ride! Through absolutely marvelous places with some marvelous characters. I loved almost everything about it... The blooming teenage love, the blossoming friendship, the sudden insight into oneself. It is a complete package. With Christmas coming in, readers are in for a Christmas treat. The sons of Santa fighting for the position and some serious treachery and war, the book sinks its hook right into you. Santa story with a twist written in simple English spiced with different languages and words like fever dream, qatiqtuqnuviyaananuq, a White Bear Cloud. All the Christmas ingredients are there: Santa Claus, not one but three; elves; reindeers, both good and bad; children. This story has witches and magic also. The story moves fast from one place to another and one character to another. There are a lot of characters and each Santa has a loyal reindeer. The story is long but once I got the hang of Santa story with a twist written in simple English spiced with different languages and words like fever dream, qatiqtuqnuviyaananuq, a White Bear Cloud. The story moves fast from one place to another and one character to another. There are a lot of characters and each Santa has a loyal reindeer. The story is long but once I got the hang of it, I just could not put it down. The book can be read by teenagers and young adults too. Lafont has written a number o Olivier Lafont is a French author, screenplay writer, and actor living in Paris.